Here's a new Mamatouille riff on a mug muffin recipe we use quite a lot. The chicory and dark cocoa powder added wonderful depths of flavor. 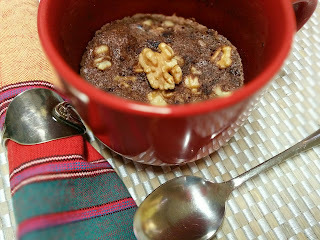 Beat everything except the walnuts in a mug with a whisk. When everything is pretty happy and blended, throw in some chopped walnuts. Microwave for 1.5 minutes (or bake in the oven if that's your preference and you have the time).